Wow this is great! This is great work! 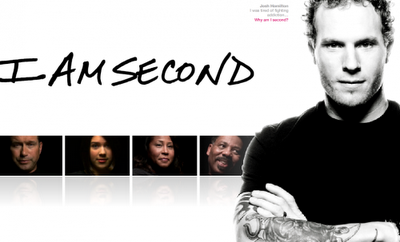 Adam Leydig is the Creative Director behind the I am Second / iamsecond.com campaign. The work was created by the newly formed creative arm of e3 Partners Ministry lead by Creative Director Adam Leydig. e3 Partners is an international short-term missions agency headquartered in Plano, Texas. Adam Leydig recently joined the ministry world prior to Publicis Advertising and is now teamed up with Nathan Sheets, VP of e3 Partners and is currently on a quest to reach people for Christ instead of brands. The videos were produced by Ditore Mayo Entertainment. The website was developed by Simply Interactive. Dear Adam Leydig, My Name is Brian please if you can contact me at Beestanger@yahoo.com, or call me at 469-212-3525, I would love to be a part of your team for Our LORD and SAVIOUR JESUS CHRIST, THE ONE AND ONLY SORVEIGN RULER, WISE GOD, AND SHEPERD. I'm currently evangelizing for christ one day, and one person at time, he that wins souls is wise. May the LORD GOD OF PEACE, OUR GOD RICHLY BLESS YOU ACCORDING TO HIS WILL. This is so awesome! I'm going to spread the word! Jesus is going to bless this effort with amazing results! God is Good, All the Time. All the Time, God is Good.